‘SHAKTI’ is the concept or personification of divine feminine creative power, sometimes referred to as "The Great Divine Mother’’. As a mother, she is known as "Adi Shakti" or "Adi Parashakti". On the earthly plane, Shakti most actively manifests herself through female embodiment and creativity/fertility, though it is also present in males in its potential, unmanifest form. Shakti is both responsible for creation and the agent of all change. Shakti is cosmic existence as well as liberation, its most significant form being the Kundalini Shakti, a mysterious psychospiritual force. In Shaktism, Shakti is worshipped as the Supreme Being. Shakti embodies the active feminine energy of Shiva and is synonymously identified with Tripura Sundari or Parvati. ?? 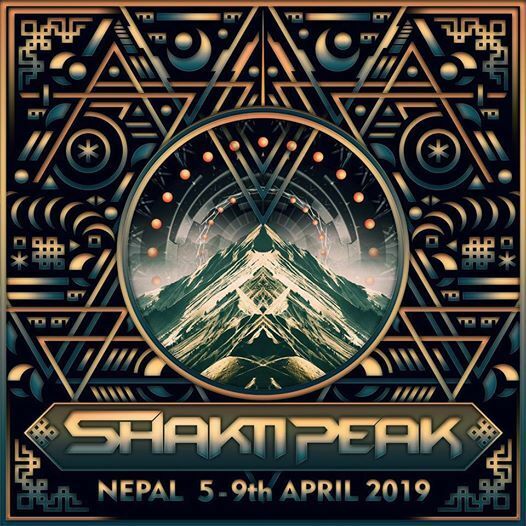 ‘SHAKTI' means the primordial cosmic energy and represents the dynamic forces that are thought to move the entire universe while 'Peak' means the highest point and through this we are here to present you the most powerful and mind altering experiences. If you feel a deep connection towards anything you love, it has a divine value attached to it. This connection elevates you, inspires you, and brings you happiness and peace, it helps in bringing a better understanding towards your own self. A union with own self is very important. Perfect union of mind body and soul can only be mastered through years and years of meditation practice but music often generates this connection within fraction of seconds. Henceforth this is what we look forward to give you. We want you to experience this divine journey through the tunes of one of the best artists. Come and let's be a part of this amazing transformation, lets experience this journey together in the serenity of the mountains of Nepal which has said to evolve the lives of many. Let's live and view this world through the eyes of Lord Shiva, through eyes of compassion and love. Team Shakti Peak are pleased to announce the 3rd edition in the most beautiful eastern side of Nepal. Let's make this a one to cherish. 5th April 2019 to 9th April 2019 . Please do not send us any more Artists' Requests! LOCATED AT THE KINGDOM OF RHODODENDRON NATIONAL FLOWER OF NEPAL. APRIL IS THE BLOOMING TIME OF THE YEAR WHERE ONE CAN FIND 24 KINDS OF RHODODENDRON OUT OF 37. FINAL MEETING POINT IS HORIZON MOUNTAIN RESORT , Dhankuta, Hile. FESTIVAL BUS WILL BE OPERATING FROM FINAL MEETING POINT TO LOCATION FROM 5TH APRIL EARLY MORNING UPTO 6TH MORNING 12 AM. AFTER-WHICH NO FESTIVAL SHUTTLE WILL BE AVAILABLE. SO KINDLY PLAN YOUR TRAVEL ACCORDINGLY. 1. Meeting point in Kathmandu is Cafe DJ Re Do, Pashupatinath Temple, front gate FROM WHERE DIRECT BUS WILL LEAVE FOR LOCATION. 2. Guests kindly make sure to reach KATHMANDU meeting point CAFE DJ RE DO by 4th APRIL, 8 AM . BUS will leave AT 9 am FOR LOCATION . 3. Meeting point for Bus shuttle is cafe DJ Re Do which WILL Only OPERATE on 4th APRIL TILL 8 AM. 4. FESTIVAL QUERIES AND TICKETS WILL BE AVAILABLE AT : BOHEMIAN PIE IN THE SKY , ABOVE FRENCH BAKERY , PAKANJOL ( 5 MINS WALKING DISTANCE FROM THAMEL . Also, Biratnagar is the nearest domestic airport, so if u wish to travel on your own you can book a flight till Biratnagar and then take a cab/bus till Horizan Mountain Resort. But please make sure u reach there by 5th April morning so you can move up easily to the venue. 1. Book a flight till Bagdogra Airport, West Bengal or you can book a train till New Jalpaiguri Station, West Bengal and then take a bus/cab towards Kakarbhitta NEPAL border, travel time will be around 1 h 10 min (35.0 km). 2. From Bagdogra airport take a bus (cheapest) or cabs (normal rates) to Kakarbhitta NEPAL Border. 3. Driving distance between Bagdogra Airport (IXB), West Bengal to Kakarbhitta border is 22.0 Km. 4. Travel time From Bagdogra Airport (IXB) to Kakarbhitta is 45 mins. 5. From Kakarbhitta border you will get direct buses or you can book cabs till final meeting point which is HORIZON MOUNTAIN RESORT , Dhankuta, Hile. 6. Travel time from Kakarbhitta to Dhankuta Hile is 5 hours (174.3 km). 7. FESTIVAL BUS FROM FINAL MEETING POINT AT HORIZON MOUNTAIN RESORT , DHANKUTA , HILE WILL LEAVE for LOCATION ON 5TH MORNING 8 AM . SO PLEASE MAKE SURE ALL GUESTS REACH HILE ACCORDINGLY. Please Note: You will find organisers at HORIZON MOUNTAIN RESORT, Dhankuta Hile from 4TH APRIL TO 6TH APRIL morning TILL 10AM ONLY. 1. Please carry a valid proof of identification at the party. 2. Right of admission is reserved with the organization. 3. Use of Audio/Video equipments is strictly prohibited. damage suffered at the festival. 6. Outside food/beverages, water bottles NOT ALLOWED. 7. Please avoid bringing plastic products and plastic bags inside the venue. Please take care of nature and keep it as ORGANIC as possible. 8. Everyone is entitled to keep their surrounding clean and tidy. Please dispose rubbish in designated areas and refrain from using plastic at all. Nepal has slowly but surely recovered from the April 2015 earthquake. Sitting at top of the world, Nepal is just one step away from heaven – and for those who have discovered the country’s many charms, it feels like it too. They say once is not enough. Travellers may obtain tourist visas on arrival at the airport and some land borders. You must pay in cash. Tourist visa on arrival: US$25 (15 days); US$40 (30 days); US$100 (90 days). Multiple-entry tourist visa in advance: £20 (15 days); £35 (30 days); £75 (90 days).